Jasper is showing his true doggy colours. He’s turned into a barky dog. He also loves to chew wood and paper. He has gone through a few toilet paper rolls already. I’ve had to spray bitter apple on the legs of our tables and the corner of the coffee table to stop him from gnawing on them. He demonstrated that he loves apple almost as much as banana by putting his front paws up on the counter to reach some I’d cut up for Boo. I figure by the time he’s his full size, he’ll be able to reach up on top of the fridge. He likes to dig and he’s a dirt-eater. Good thing my back lawn is already dead so when he starts digging holes in it when the snow melts, it won’t bother me so much. He cannot accept that he isn’t supposed to be on the bed with us. I was lying on our bed with the kids, reading bedtime stories, when he popped up and then lay flat down, smushing his head into the duvet and looking up at me with the most innocent eyes, so I didn’t have the heart to throw him off. He just can’t see why he has to be way down there on the floor when everyone he loves is up on the bed together. Of course, we all love him madly now, so he’s timed his personality revelations well. Didn’t I say he was brilliant? It actually knits up quite quickly, given that I’m using 2.5 mm needles. Knitting at red lights helps. I’m not going to say it! You don’t have to – I know you are thinking it anyway! I’d say your best answer is to take a knitting class. There are now tons of ‘how to knit’ books out there, but I imagine it would be a little tough to actually teach yourself from them, although you could try that. But having someone there to tell you exactly where you went wrong as you knit is what you really need. I then taught everyone I ever lived with – 4 different university roommates and my husband. Oh, and Maya. Asher is asking to learn now. 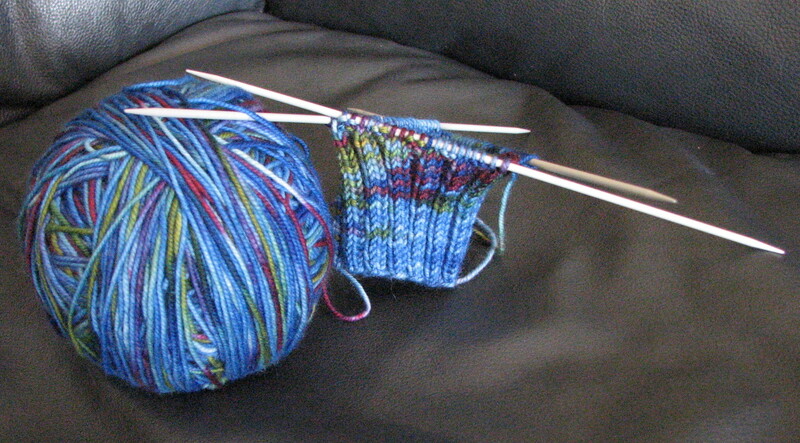 The best thing is access to someone who can knit.